Here are some photos that i have had for a while that I needed to post (along with their stories). Sorry for the hodge podge of information! Approximately six days after buying four brand new tires, I went to my car in the morning only to find this sticking out of my now flat tire. Joy. The good news is that they replaced it. Here is a before and after of some wall tiles that we have. We have had them for about three years. When I bought them they were shiny red, but I painted them to match our decor(one orange, one deep red and another brown). They were matte in appearance and I have always thought they might look better with a glossy coat. So I gave them a little gloss! Before - except for in bright light, you couldn't see the awesome pattern on the tin tile. After - now the unique texture is more obvious. I received some doilies recently from my parents. They were doilies that my grandma Patterson had and some of them were even made by my great grandmothers. I wanted to display them in a fun way (see this post), so I looked high and low for fun frames to set them off. Eventually I found these frames at Esme's. Esme's is the world's greatest junk shop. Seriously. They are only open once a month and are "on the path" to closing as they gradually sell out their vast storehouse. But I am optimistic that they will never really close their doors. At least not while I'm around. :) But I digress. These frames were hideous. I do not have any photographs that do them justice. They were bright gold and very ornate (well they are still ornate, I guess). Now, they are a nice tone of "hammered steel". Here is the before. Seriously, if you ever spray paint this is the best stuff in the universe. With the hammered steel look it disguised uneven spraying and looks good on everything! Now that they are done, I need to choose the colors I want to use for our bedroom. Marc and I are going to get a new comforter. We love our "current" one, but it is NEVER used. It is HUGE and cumbersome and it is easier to just keep it in the closet. We don't sleep with it because it is silk and satin, and taking it on and off the bed is just not that practical for us. We are going to keep it for a guest room someday, but in the meantime, we want a nice bedspread/comforter that we can easily sleep with, launder and decorate around. So finding a nice new comforter is next on my list. 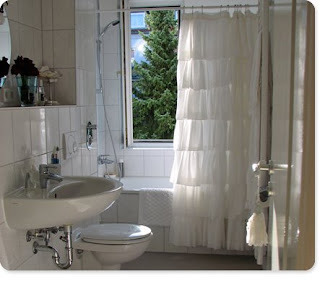 It has to be cheap and it needs to go with our dark brown (chocolate) curtains. Let me know if you have ideas of stores I should check. On a completely different note. I called my Mom last week and I was surprised to hear a voice from my past! 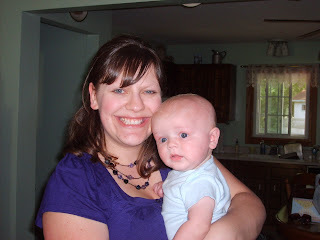 My friend from high school, Christie, was at Mom and Dad's with her cute little boy Elliot! Isn't he adorable?! I haven't seen Christie since our sophomore year of college, so it was nice to chat with her on the phone. It sounds like she is a great momma and I look forward to seeing her the next time I am in South Dakota. Congrats on the cutest little bug, Christie and Brad! What do you get when you mix Midwestern do-it-yourselfers with a car in need of an oil change? A good old-fashioned oil-change-by-flashlight, of course! Here our the upstairs neighbors Amber and Chris working to change the oil in Amber's car. Julie always has to get in on the oil change action. She is truly her father's daughter! RJ, making sure Julie was okay under the car. :) So sweet! I am pretty sure that is enough randomness for now. 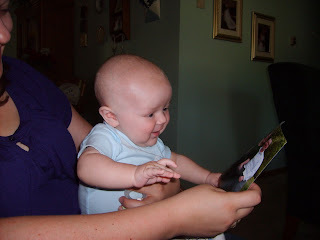 If you like, check out my "other" work-related blog (http://www.methodistchildrenshome.blogspot.com). From Henri Nouwen, purveyor of all things spiritually introspective. "Our emotional lives move up and down constantly. Sometimes we experience great mood: swings from excitement to depression, from joy to sorrow, from inner harmony to inner chaos. A little event, a word from someone, a disappointment in work, many things can trigger such mood swings. Mostly we have little control over these changes. It seems that they happen to us rather than being created by us. Thus it is important to know that our emotional life is not the same as our spiritual life. Our spiritual life is the life of the Spirit of God within us. As we feel our emotions shift we must connect our spirits with the Spirit of God and remind ourselves that what we feel is not who we are. We are and remain, whatever our moods, God's beloved children." I guess I've been dealing with this a lot lately. I have been struggling with my emotions and my desire for meaningful friendships with other women of God, and it is easy to let that control my spiritual walk as well as my emotional life. 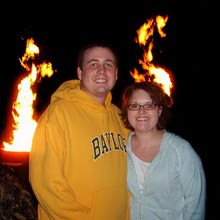 Being so far from the support of family and friends who have known me my whole life makes it even harder to see the silver lining on this Waco chapter of our lives. While my husband is amazing and I have some wonderful friends here, there is something precious about feeling "known" by another feminine soul that I long for and miss. But I know that Nouwen is right. What I feel is not who I am. Though I feel lonely I am never alone. Though I feel forgotten there is one who never forgets. Though I feel hurt and unimportant there is One who binds my imagined wounds and values me enough to give His life for me. And though I feel afraid I am not in danger. My prayer is that the truth of these statements would seep into every part of my soul, offering hope and comfort. Things have been a bit busy around here lately, so I haven't posted nearly enough pictures with my posts. I guess I just hate waiting around for Bloggers slow uploads. :) Here are a few fun ones from the last month or so. I like to call this one, "What is, "That thing you never want to see on your sidewalk unattended." Marc and I on our little Austin getaway. We did this on MCH's dime too! The great thing about my job is that I can combing work and pleasure. I had a meeting in Austin for work and I took Marc along so we could celebrate his birthday Austin style! :) Here we are at Kurby Lane enjoying an outdoor lunch. Me and my little Lynne. This was on the Fourth of July right before we went to watch the fireworks. Lynne and her hubby Adam (and little Kyleigh Jo - in utero, of course) joined my parents and I for the fourth of July. It was a ton of fun. I made this flower pin for my purse. It is made from a fabric covered button! So, at that point we decided to not kiss until we got engaged (and then, only when we said goodbye at night). We also decided to have a "no-horizontal" rule. The no-horizontal rule is simple. Only one of us could be horizontal at a time. For example, Marc could lay down with his head in my lap, but I had to sit up. Or, I could lay down, but Marc had to sit up. The idea was that it would help set a boundary. It is silly, but it was our rule. 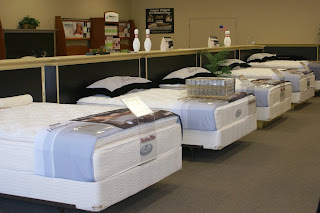 In May before we got married, we went to Unclaimed Freight Furniture to select a mattress. The salesman patiently took us around to each of the mattresses and sold us on their "features." At each of the beds Marc would lay down, get up and then I would lay down. Occasionally we would both be on the bed at the same time, but one of us would sit up as the other laid down to try it out. After several beds, the salesman looked at us quizzically and said, "You know, you CAN both lay down on the bed at the same time, right?" It was hilarious. Of course, I'm sure we looked so stupid to him and to every other salesperson and customer in the store, but to us we were just following the "rules." After turning red, mumbling something about purity, and buying a mattress, we laughed our heads off. It was hilarious. And the bed selection was great, even if it was selected in an "unconventional" manor. We must have been crazy, Mom. I don't know how we survived this project with all our fingers, let alone our sanity. Here is a little look at what my Mom and I made over the 4th of July weekend/vacation. It only took the two of us two full days of work! Sense the sarcasm? By the time we were nearing completion my sanity was questionable and I would have definitely given up if it were not for my steady sewing-guru-of-a-mother. Thanks, Mom. 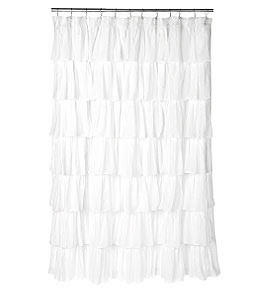 Here is the EXPENSIVE version of the pretty ruffled shower curtain from India Rose. It is called, and I am not kidding about this one, the "White Devil." For a mere $98 dollars this could be yours! "Well," I thought, "I could make that!" And I was right. I could. But now I know that I would never want to. I also know why it is called the "White Devil." That thing is a monster dressed in white frills. Here is another inspiration photo from Anthropologie and it sold for a mere $98. I love their stuff. Someday when my husband is a wealthy pastor I'll have to buy stuff from their magazine (ha!). Until then, I'll just keep *ahem* stealing their great ideas and repurposing them for my home (on a much cheaper scale). 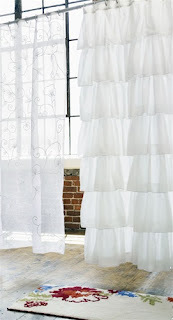 Note: This is no longer on the Anthropologie site (now they only sell colorful versions of the curtain). I don't remember where I found this inspiration photo (if you find it, let me know and I'll link to it). This was the biggest inspiration piece for our creation. 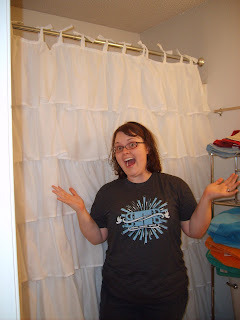 And here are some photos from our sewing adventure. Our sewing setup in the dining room. Even after all this fancy math work we still went back to the fabric store TWO TIMES to get more fabric. What can we say, we never claimed to be math whizzes! He LOVED resting on the ruffles. Ignore the toilet, towels and bad photography. Beyond that I think it looks pretty good. Thoughts? I also like our tab-tops a lot better than the button holes on the original. Love you, Mom. Come back to Texas!!!! The preacher's 5 year-old daughter noticed that her father always paused and bowed his head for a moment before starting his sermon. One day, she asked him why. 'Well, Honey,' he began, proud that his daughter was so observant of his messages. 'I'm asking the Lord to help me preach a good sermon.' 'So, how come He doesn't?' she asked.